Property Location A stay at Econo Lodge places you in the heart of Ormond Beach, steps from Destination Daytona and close to Addison Blockhouse Historic State Park. 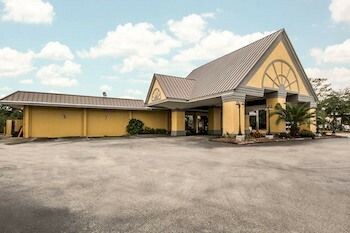 This hotel is within close proximity of Tomoka State Park and Riverbend Nature Park.Rooms Make yourself at home in one of the 128 air-conditioned guestrooms. Complimentary wireless Internet access keeps you connected, and satellite programming is available for your entertainment. Bathrooms have shower/tub combinations and hair dryers. Conveniences include phones, as well as desks and blackout drapes/curtains.Rec, Spa, Premium Amenities Take advantage of recreation opportunities such as an outdoor pool, or other amenities including complimentary wireless Internet access and a television in the lobby.Business, Other Amenities Featured amenities include express check-out, a 24-hour front desk, and multilingual staff. Free self parking is available onsite.